HypoBand - The Life Saver is a soon to be launched product designed to alert caregivers, when the life of a diabetic patient is in danger. It is designed to work, during cold sweat; (Hypoglycemia) in which a distress call is made on auto mode. A panic button is also included. We started this project because the HypoBand is about saving lives and preventing unnecessary deaths. According to the World Health Organization, there are 347 million diabetes sufferers worldwide. It is said that every 10 seconds, one death is attributed to diabetes related causes. In Malaysia alone, 1 out of 8 adults has diabetes and 50% of them don't even know that they have diabetes. Hypoglycemia fatalities (diabetes low blood sugar level) are a leading contributor to these deaths. 1 in 20 people die from low blood sugar from a hypoglycemic attack, adding up to about two million deaths a year. Many of these attacks take place at night when the diabetic patient is asleep and unaware that his or her blood sugar level has dropped to dangerous levels. The idea of Hypoband came into inception from the founder's father having too frequent and dangerous hypoglycemia attacks at night. This effort was further accelerated when his aged diabetic neighbor had a fatal hypo attack. She was a spinster living alone, and no one came to her help when all she needed was just a can of sweet drink. We created the Hypoband in the hope that it will save lives and give peace of mind to diabetic patients and their loved ones. 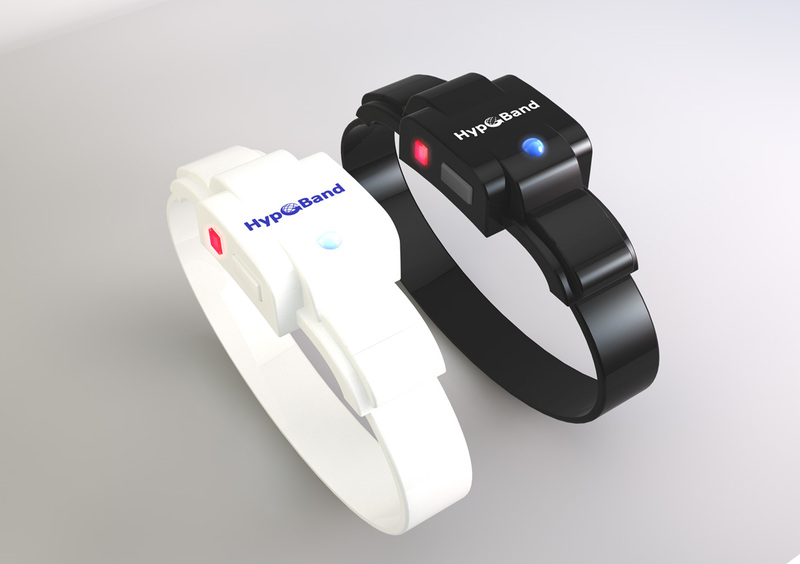 The Hypoband works in conjunction with an App that runs on Android smartphones. It makes auto calls and sends out pre written text messages (SMS) to caregivers, doctors or hospitals during an emergency hypoglycemic attack. It also has a local alarm mode that allows caregivers sleeping near the patient to be woken up to assist the patient. The Hypoband has an inbuilt high tech sensor that accurately detects cold sweat by monitoring the patient's temperature and sweat levels. It also has a panic button that can be triggered in case of an emergency or a fall at home. Auto calls or text messages similar to the cold sweat detection mode will be sent out. This is useful for aged people living alone. We are requesting a fund of USD18000. The fund requested will be used to source for electronic components for a minimum quantity order of 1000 sets to launch HypoBand into the market. The support and pledges that the project receives might even save the lives of your loved ones, families and friends. Ultimately it is a do good, global humanitarian cause to combat deaths due to Hypoglycemia attack amongst diabetics. Your support will enable us to realize our vision to bring HypoBand to the global market a step closer. Also, for those who would like to pledge but prefer not to use your credit card or paypal CAN DO so by e-mailing directly to [email protected] and indicate to them your pledging reward selection. Help us to get HypoBand funded! One E-book on "Diabetes Prevention, Treatment and Living a Healthy Diabetes Free Life"
One E-book + Discount voucher worth USD50 for a HypoBand bought. The voucher is valid till 31st December 2013. The retail price of the HypoBand is USD160. One E-book + 5 units of HypoBand. The retail price for 5 units of HypoBand is USD800. One E-book + 12 units of HypoBand. The retail price of 12 units of HypoBand is USD1920. One E-book + 60 units of HypoBand. The retail price of 60 units of HypoBand is USD9600. (Country /State distributor package)+ 6 months exclusivity (terms and conditions apply) + factory tour on how HypoBand is manufactured and also a tour of Penang. Flight tickets and accommodation not provided.